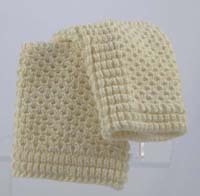 100% cotton knitted dishcloths. These dishcloths have a great texture for scrubbing. Measures approximately 10 X 10 inches.